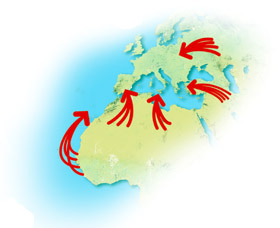 The Common European Asylum System was designed to establish a fair and effective distribution of the burden on the asylum systems of the EU Member States. Regulation No 343/2003 was passed in order to introduce a clear and workable method for determining which single Member State is responsible for determining any given asylum application lodged within the European Union. The measure was also intended to prevent forum shopping by asylum seekers. Where a third-country national has applied for asylum in a Member State which is not primarily responsible for examining that application under the Regulation, it provides for mechanisms for the transfer of the asylum seeker to the Member State which is primarily responsible. The problem with the Regulation is it was passed before the current crisis in the eurozone. Asylum overloading is one of the many problems afflicting parts of the EU, in some cases involving countries at the epicentre of the debt crisis. The Regulation does not contain any provisions that deal specificially with this situation, particularly where the Member State, because of its geographical location, faces numbers of asylum seekers that far exceed its capacity to cope, with the result that it cannot guarantee that those asylum seekers will be treated in accordance with the minimum standards in the Common European Asylum System. This is illustrated particularly clearly by this UK reference for a preliminary ruling, in which the referring court has asked the Court to clarify the way in which the overloading of a Member State’s asylum system affects the EU arrangements for determining the Member States responsible for asylum applications lodged in the European Union. In the main proceedings, an Afghan asylum seeker challenged his return from the United Kingdom to Greece. On his journey from Afghanistan to the United Kingdom, he had travelled through Greece, where he was arrested and fingerprinted. He did not claim asylum there and was subsequently expelled to Turkey. Having escaped from detention in Turkey, he made his way to the United Kingdom, where he arrived on 12 January 2009 and applied for asylum on that same date. The Administrative Court ordered that his case should become the lead case in England and Wales on returns to Greece under Regulation No 343/2003. See our post on the UK proceedings here. The court formulated a number of questions for referral to the European Court of Justice, essentially asking whether EU law required the United Kingdom in such circumstances to assume responsibility for examining asylum applications itself, even though Greece was primarily responsible for the examinations under the Regulation. The answer to this may seem obvious but it is important that the point is clarified because the first sentence of Article 51(1) of the Charter of Fundamental Rights states expressly that the Member States are bound by the Charter only when they are implementing EU law. In deciding any asylum application, the state is not ipso facto implementing EU law. In the light of the current crisis affecting the Greek asylum system, the question also arises for all Member States, not just the UK, whether asylum seekers may be transferred to Greece under the Regulation if there is a risk that Member State would not comply with its obligations under Directives 2003/9, 2004/83 and 2005/85, which lay down minimum standards for protection in the event of a mass influx of persons, for the status of third-country nationals or stateless persons as refugees and for granting and withdrawing refugee status respectively. Because the Charter was the focus of these proceedings, the referring court also requested clarification about the content and scope of the UK and Poland “opt out” Protocol. 2. When making this decision under the Regulation, a rebuttable presumption may be made that the Member State responsible for examining an asylum application will act in accordance with EU law and international law. But the asylum seekers must be given the possibility, procedurally, to rebut that presumption. 3. Where that presumption is rebutted in a specific case and it is not guaranteed that the asylum seeker will be treated in accordance with international law in the responsible State, a transfer to that State is precluded and the right to assume responsibility for the examination under Article 3(2) of Regulation No 343/2003 exceptionally becomes a duty. 5. A national law imposing a conclusive presumption that each Member State is a safe country from which the asylum seeker will not be sent to another State in contravention of his rights pursuant to the ECHR and the Geneva Convention is therefore incompatible with Article 47 of the Charter of Fundamental Rights. This is because such a presumption renders excessively difficult or even precludes de facto the judicial review of the risk of chain deportation to a persecuting State, which is incompatible with the Charter of Fundamental Rights. 6. On the other hand, even “serious” risks of infringements of individual provisions of the Common European Asylum System Directives in the Member State primarily responsible are not sufficient to create an obligation on the part of the transferring state to assume responsibility for the asylum examination, provided these infringements do not also violate the Charter rights of the asylum seeker to be transferred. Any stricter interpretation would result not only in a far-reaching exclusion criterion which would “completely undermine” the rules on responsibility formulated in Regulation No 343/2003 but could also jeopardise the aim of those rules, which is to determine rapidly the Member States responsible for examining asylum applications lodged in the European Union. 7. The provisions of Protocol No 30 do not affect these answers. The first provision of that Protocol does no more than reaffirm the normative content of Article 51 of the Charter of Fundamental Rights, which seeks to prevent any extension of EU powers or of the field of application of EU law. The only way in which the Protocol would affect the outcome of such a question is in relation to the Charter’s section on social and economic rights, which it rules out as non-justiciable. As the contested rights in the present case were not among those social rights and “principles” there was no need to examine in any greater detail that operative part of the Protocol. Human rights – Strasbourg or Luxembourg?